This disc is a combination of tracks cultivated from the "Good As Dead" lp and a split 7" but I think this is the first real exposure for these songs in the U.S. GOMORRHA play a vehement brand of grindcore. They are so barbaric and insane in their delivery that it is amazing they can keep their sound from spiraling out of control. They are on the verge of chaotic derangement the entire album... definitely a plus for a raw grind act! They mix low end sewer growls and high screeches in the classic Japanese style (although they hail from Germany). They generally have two tempos, blur and blinding, although they don't let the excess of speed keep them from churning out incredibly heavy riffs and slowing down for small sludge filled moments. Especially plodding is the "Outro" which is so morose it is reminiscent of DISEMBOWELMENT. 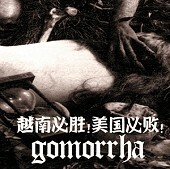 There is nothing new being done for the grind scene on this CD but GOMORRHA definitely do what they do well! You will be hard pressed to find a more intense CD anywhere.